With a secret healthy ingredient! The challenge will be to eat just one.. I was intrigued by a recipe I saw on Kristin's blog for Lemon and Blueberry Chocolate Chip Muffins that incorporated lentils into the recipe. I will likely try out that muffin recipe soon. From K's site I was lead to the lentils website that has lots of recipes with lentils. I was attracted to this granola bar recipe and decided I would try it. Due to my longer runs, I am constantly hungry these days and want to be sure I have healthy snacks I can eat throughout the day. 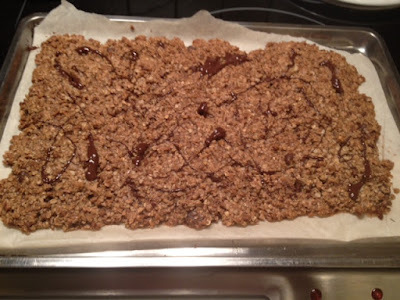 I have never made granola bars before, I felt they were too complicated/sticky to make. 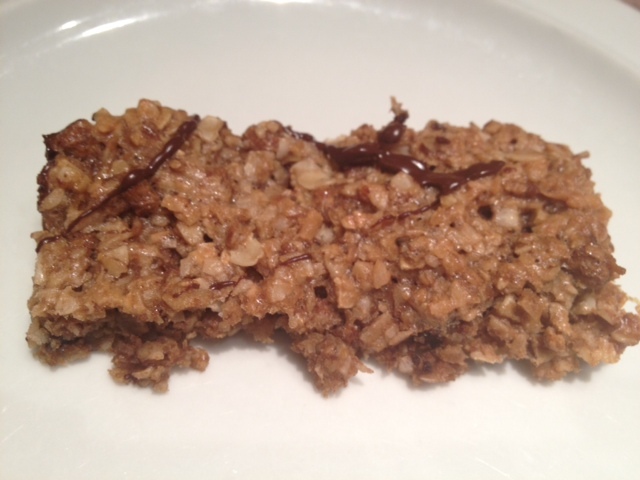 These were really easy and better then any granola bar i've ever bought. You actually can't even taste the lentils. health benefits of lentils: Lentils are high in fiber and complex carbohydrates, while low in fat and calories. They are naturally gluten-free, exceptionally low glycemic index, and have a high protein content. 1)Preheat oven to 350°F (180˚C). Make sure rack is in centre of oven. 3) Add lentil purée, oil, egg, and vanilla. Mix until dry ingredients are just moistened. 4) Spread over a 10 ½ x 16 (25 x 40 cm) nonstick cookie sheet. Bake 30 minutes, or until lightly browned. While bars are still warm, drizzle chocolate over top and cut into 35 bars. For the cooked lentils, combine all the ingredients in a medium saucepan over medium-high heat. Bring the works to a full boil then adjust and lower the heat, just enough to maintain a slow, steady simmer. Cover tightly and continue cooking until the lentils are soft and tender, about 15 to 20 minutes. For the lentil puree, pour the cooked lentils into your food processor. Add the water and process until a smooth puree resembling canned pumpkin forms, two to three minutes. If the texture seems too thick, add another tablespoon or so of water.